If you have visited Stade de France, why not submit your image of the view that you had. From the ratings submitted, Seat Blocks at Stade de France have been given an average rating of 4 out of 5. This is how our site users rate the seat blocks at Stade de France. Seat block A1 gets the best rating at Stade de France. Click for more information. The Stade de France is the national stadium of France. It has a whopping 75000 capacity, which makes it the 6th largest stadium in Europe. In 2015, the Stade de France will be hosting games for the Six Nations Rugby Championships. Seat are split into blocks. When looking for seats at the Stade de France, it is important to realise that not all consecutive seat block numbers are adjacent to each other. Seat blocks containing similar letters may be in different tiers. 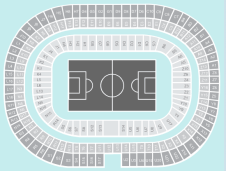 The seat blocks closest to the pitch are G5 - G8, H1 - H4, J1 - J4, K1 - K4, L5, L6, L13, L14, N9, N10, N15, N16, R13, R14, S5 - S8, S12 - S14, T1, T2, U5 - U9, U17, U18, X8, X9, Y3, Y4, Y9, Y10, Z1 - Z4, Z9, Z10, A5, A6, B5 - B8, C5, C8, D1, D2, D4 and D5. 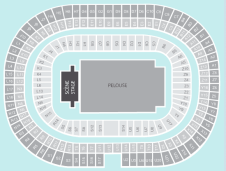 In the second tier of seating at the Stade de France, you will find seat blocks E1 - E14, H11, H12, K5 - K10, L9 - L12, N3 - N6, N17, N18, R1, R2, R9 - R13, T5 - T7, U11 - U15, T9 - T11, X2 - X5, X14, X15, Y1, Y2, Y14 - Y16, Z11 - Z14, A9 - A12, B11, B12, C3 and C4. In the final and highest tier, you will find seat blocks D6 - D9, G1 - G4, H7, H8, H5, H6, J7 - J10, L1 - L4, L15 - L18, N11 - N14, R3 - R6, S1 - S4, S15 - S17, U2 - U4, U19 - U21, X10 - X13, Y5 - Y8, Z5 - Z8, A1 - A4, B1 - B4 and C7 - C9. 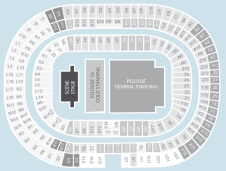 We currently do not have any events listed at Stade de France, please click on a seating plan for more information about seat locations at Stade de France.